US President expresses hope White House will prevail in lawsuit filed by CNN over Jim Acosta incident. US President Donald Trump on Wednesday expressed hope that the White House would prevail in a lawsuit filed by CNN regarding the revoking of reporter Jim Acosta’s press credentials. “I don’t know, we should … We’ll see how the court rules. Is it freedom of the press when somebody comes in and starts screaming questions and won’t sit down?” Trump said in an interview with The Daily Caller website. CNN filed the lawsuit against the White House on Tuesday morning. The suit claims the revocation of Acosta’s press pass violates their First and Fifth Amendment rights. The lawsuit followed Acosta’s fiery exchange with Trump during a press conference last week. Acosta continued to press Trump, despite Trump’s demand that he "put down the mic," before a White House official finally took the microphone away from him. Hours later, the White House announced that it had suspended Acosta's credentials due to the fact that Acosta become physical with a young female intern as he tried to ask Trump a question during the news conference. Trump told The Daily Caller that Acosta’s refusal to give up the microphone and general “grandstanding” was unfair to the rest of the White House press corps. “Jim Acosta is just somebody who gets up and grandstands, he doesn’t even know what he’s asking you half of the time,” said Trump. 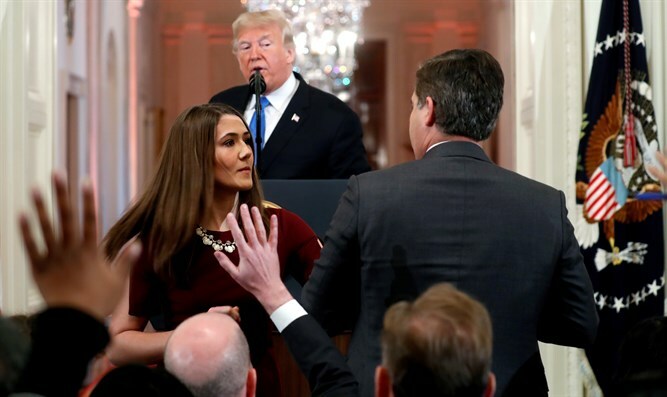 Of Acosta’s alleged kerfuffle with a White House intern, he added, “He was very rude to the young lady,” though he focused his ire on the CNN reporter’s style of journalism. “I really think that when you have guys like Acosta, I think they’re bad for the country … He’s just an average guy who’s a grandstander who’s got the guts to stand up and shout,” said Trump. Trump has been a vocal critic of much of the mainstream media, and particularly of CNN. Shortly after Trump was elected president, he and Acosta got into a shouting match similar to that which occurred on Wednesday, when Acosta insisted on asking Trump a question after Trump dismissed a CNN report on Russian hackers having sensitive information about him.